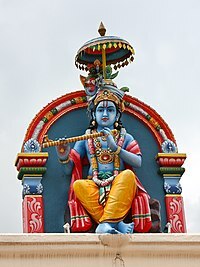 Krishna is an important figure in Hinduism. He is considered to have been an Avatar of the god Vishnu. Krishna is believed to have been a real person who took part in the war known as the Mahabharata. He is a central character in the important Hindu scripture the Bhagavad Gita. Hindus often consider him a warrior, hero, teacher and philosopher. This page was last changed on 14 January 2019, at 13:26.